A personalized burgundy & white 48” arc auto - open fashion umbrella is an eyeball roller and is largely sought during fashion shows and for decorations. 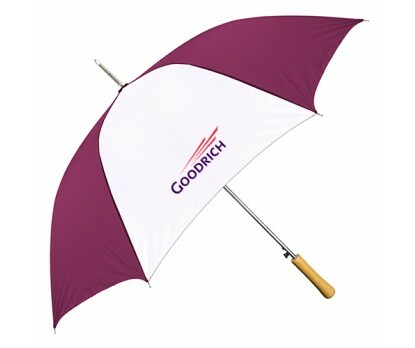 Logoed promotional burgundy & white 48” arc auto-open fashion umbrellas are favored for business gifting by marketers in fashion related niches and it is also teamed with many creative representations. The combination of burgundy and white is used for various fashion representations, art presentations, and many more. Custom burgundy & white 48” arc auto-open fashion umbrella can be handed out as a business gift or sales driving token during festival seasons or on special occasions. Features – metalized shaft with matching tips and ferrules, attractive 48”burgundy and white canopy, pushbutton automatic opening, wooden grain handle and matching fabric case with shoulder strap. Imprint area - 7”H x 7”W.